You may be aware that the Government has asked local councils to set targets to meet housing needs of the country. As a result Leeds City Council has produced proposals to build 70,000 new homes across the city. Consultations on The Leeds City Council (LCC) proposed specific sites took place from 22nd September to 16th November 2015. 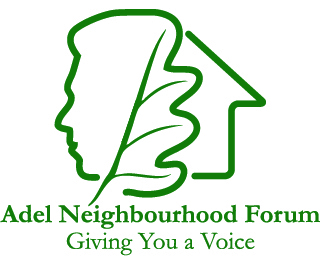 Our three local Councillors co-ordinated three events with Members of Adel Neighbourhood Forum, Adel Association and Cookridge Garden Covenant. Presentations were given by Cllr Barry Anderson at all three events. The events took place at The Friends Meeting House in New Adel Lane, The Adel Methodist Church Hall and The Old Stables, Back Church Lane. The response was very encouraging with healthy attendances at all three events including standing room only at the final event in the Old Stables. A re-occuring theme was the objections to the proposals to build on the green field sites opposite the Adel Parish Church on Church Land and on Dunstarn Lane. The reasons cited were that Adel’s facilities and schools cannot cope with addition homes on top of the already agreed sites. In any case brownfield sites should be exhausted first. Other issues were the traffic implications, heritage and landscape, including flooding. The next steps are that LCC will have further consultation on major modifications before submission to the Secretary of State. After which there will be an examination in public before the Inspector’s Report.